Keeping You Compliant. Keeping You Safe. 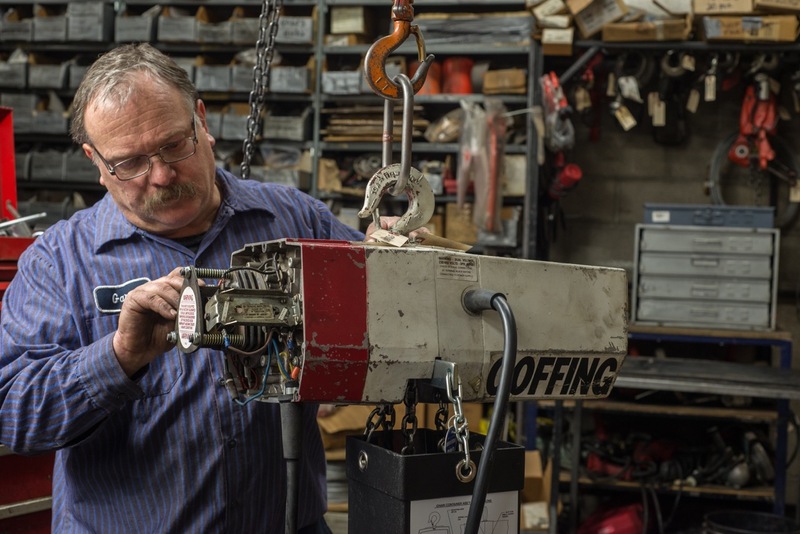 Olsen Chain & Cable's experienced, qualified inspectors and refurbishing technicians conduct OSHA safety and performance inspections on chain, cable, slings, wire rope, lifting equipment, and hoists. All operating mechanisms must be checked daily by the hoist operator before the first use of each shift. Olsen can provide training and checklists for these daily quality control checks. All wire rope, chain, and hooks must have a documented monthly inspection. Olsen can conduct and document these inspections. OSHA 1910.179 requirements dictate a yearly complete hoist system inspection. Olsen can conduct and document these necessary inspections. OSHA 1910.184 & ASME B30.9 requirements dictate yearly inspections on cables and slings. Olsen can conduct these inspections and can provide OSHA-required documentation. OSHA 1926.502 Regulations for Construction and OSHA 1910.66 Standards, in addition to OSHA and ANSI A10.32-2012 and ANSI Z359 Fall Protection Code, require fall protection equipment inspections. Olsen can conduct these inspections and provide the documentation you need to show compliance. Olsen provides service, inspection, and refurbishment of many hoist and crane makes and models*. Our qualified technicians are continually updating and expanding their skills and expertise and will be your single point of contact to ensure that your crane installation and service work goes smoothly from beginning to end. Because we believe it is our job to keep you moving, we can provide inspection scheduling and reminders on an annual basis that will ensure your equipment is falling within OSHA and ANSI safety and efficiency standards. Olsen Chain & Cable inspects your lifting equipment whether you purchased it through us or not. Our lifting equipment inspection services for chain slings, cable slings, wire ropes, hoists, webbing slings, and round slings, overhead cranes, hoists, jibs, chainfalls and lever pullers help keep your facility safe and keep you operating safely and efficiently – and up to OSHA requirements. We test and certify every piece of lifting equipment we work on and provide documentation to keep you in compliance. For more information, contact us. See OSHA guidelines for slings. Our in-house refurbishing department can also get your facility equipment back to work.